Happy New Year from the staff and management at Oil-Electric! I shot this scene in Seattle Washington August 19, 1961. "Crew Four," tip toes through the Argo Interlocking Plant, heading south to Portland, Oregon. 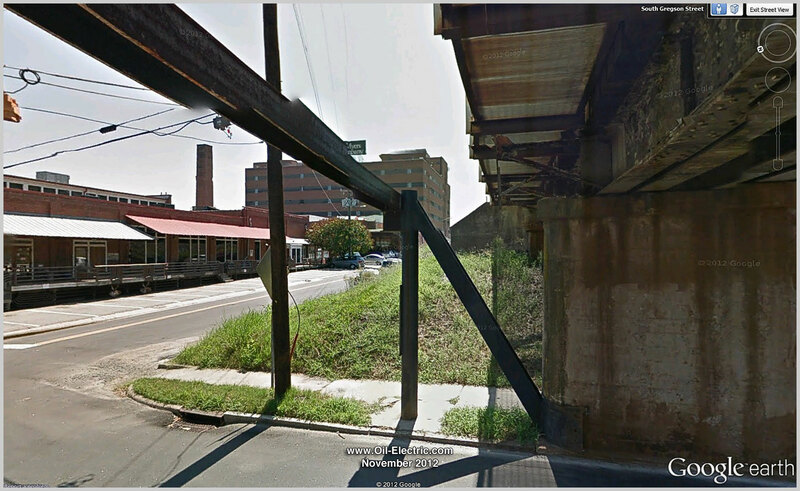 That's the Airport Way Viaduct - we called it the Georgetown Bridge - in the background. Argo Tower, built in 1913, was a join operation of OWR&N (Oregon, Washington, Railroad & Navigation) which became Union Pacific, Great Northern, Northern Pacific, and Pacific Coast Railroads. An unusual lash up! Sequential unit numbers! Great Northern 205, 206, and 207 on point. 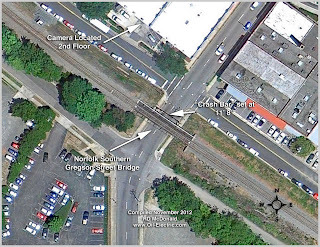 Having travelled at a snails pace down from Interbay Yard to south Seattle, the crew ended up facing a red light at the opposite end of the Argo Interlocking Plant, controlling the cross overs of the four major railroads. The aggravated engineer begins sending a series of four blasts, each sounding more impatient as the pattern went from short to long, calling for signals. 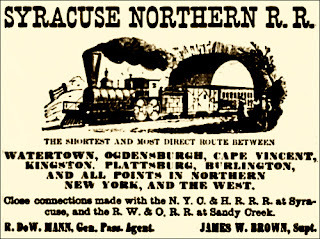 Long before the Digital Age, train wires on the pole carry traffic for the Pacific Coast Railroad, Union Pacific Rail Road, Northern Pacific Railroad and Great Northern Railroad, as well as other customers. American Locomotive Company (ALCo) built this trio of 1500 hp RS-2's in August 1947. They were equipped with steam boilers, enabling them for passenger service. Traded in to General Electric for U25B's in 1964, just three short years after I shot them. Great Northern ordered 20 RS-2's between 1947 and 1950. Five were equipped with steam boilers. All escaped the horrid "Big Sky Blue" paint scheme. "Argo" was the name of a junction on the Northern Pacific Railway 3.2 miles south of Seattle in the community of Georgetown. 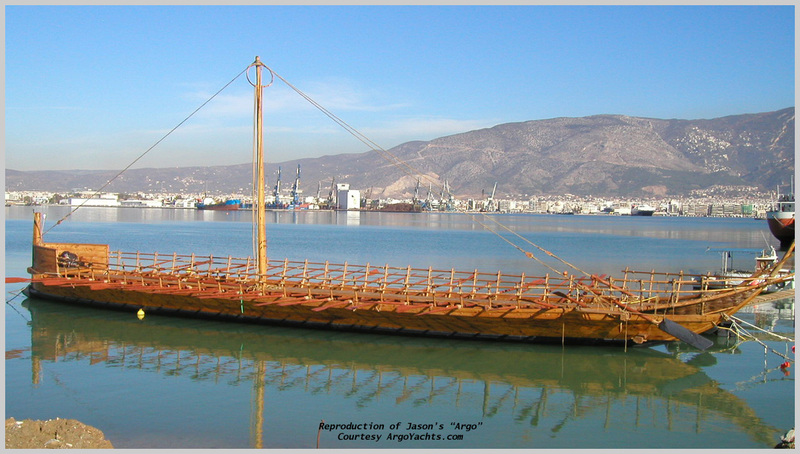 The place was named for the Greek legend about the Argonauts who sailed on the ship Argo to seek the famed Golden Fleece. having writ, moves on ... "
I snapped snowplow X-900215 in July, 1960, in Tacoma Washington. This Milwaukee Road snow plow was built as a steam driven rotary. Milwaukee Road's Chief Electrical Engineer, Laurence Wylie, was the architect for converting her from steam to electric by replacing the boiler with two GE direct current traction motors. And adding a pantograph to gather 3,000-volts from the overhead wire to drive the blades, not propel the plow. In all, there were four steam to diesel conversions; X-900212 and X-900214 were assigned to the Rocky Mountain Division on St. Paul Pass between Avery and St. Regis. 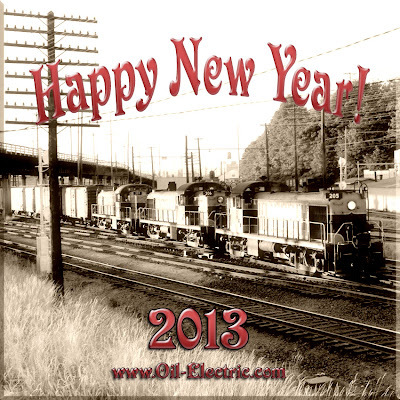 X-900207 and X-900215 were assigned to the Cascade Division, operating mainly on Snoqualmie Pass between Cedar Falls and Easton. 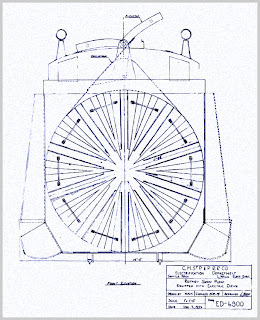 These rotary's were often referred to as "slide rotary's." They had fewer blades - but much stronger - for tossing small trees and boulders off the track! 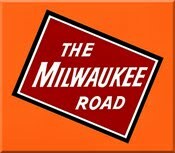 All remaining Milwaukee Road steam rotaries were scrapped in the ‘70’s. Here be a photographic roster showing the variety of snow plows employed by the Road. 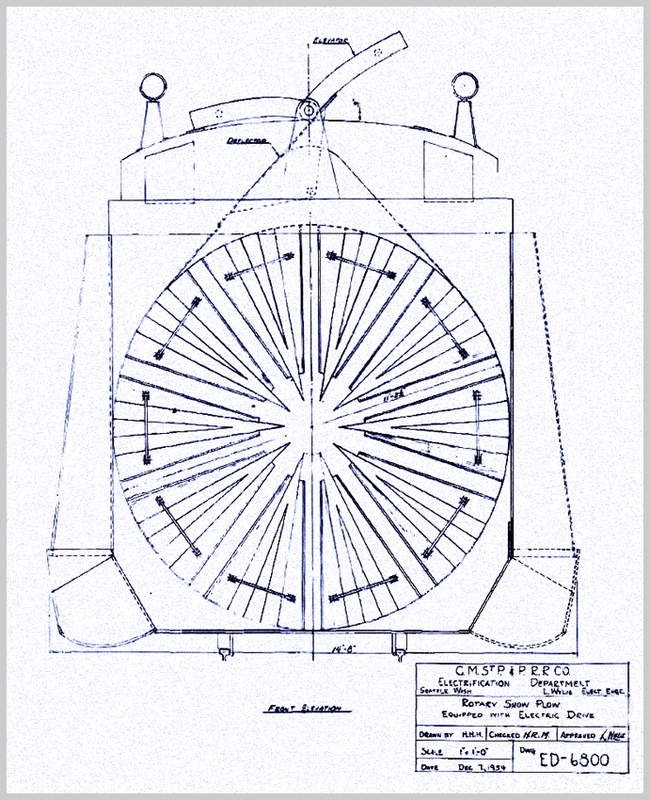 From the Milwaukee Road Archives, the Operation Manual for snow plow X-900212. Note the letter signed by the legendary Mr. Wylie! Railroad Stuff: Milwaukee Road X900215, built by the American Locomotive Company, Cooke Works, August 1906. Converted to electric drive 1955. For the second time, Time Magazine features President Barack Obama as 2012's "Person of the Year." It's been an absolute pleasure to have him "on the bridge." Among other accomplishments, he worked as a civil rights attorney in Chicago and taught constitutional law at the University of Chicago Law School from 1992 to 2004. He exhibits intellect. Can string two sentences together that make sense. He has a down to earth sense of humor, infectious smile. He has endured unprecedented rudeness, epithets, and Mitch McConnell's gang determined to make him a "one term president." As compared to the intellectually challenged dolt he replaced., who couldn't man-up to his Air National Guard assignment. 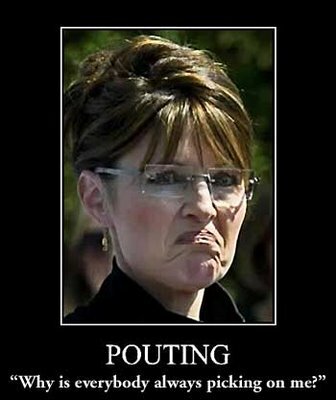 And the "gift that keeps on giving" - Sarah Palin - in her over zealous denunciation of the president being featured again on Time's cover, once again provided us with a healthy belly-laugh. On Fox News last night, Sarah Palin admitted some skepticism about the relevancy of TIME magazine, which named President Obama as "Person of the Year," because, she said, she was also on that list. "I think there's some irrelevancy there, to tell you the truth,"
Palin told Greta Van Susteren. "I mean consider their list of the most influential people in the country and the world, some who have made that list - yours truly! 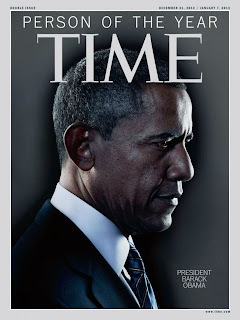 That ought to tell you something right there regarding the credence that we should give TIME magazine and their list of people." A friend of mine was telling me about a letter to the editor that appeared in the Bellingham (Washington) Herald, praising the president for the plummeting gas prices! In Port Townsend at Safeway yesterday, $3.29 for regular unleaded, and 25 miles to the west, at Sequim's Safeway, $3.19! I was really upset, because I blew my allowance earlier in the day at $3.29! I would like to thank President Obama for his continuing efforts to lower the price of gas. Over the past few months, I have noticed the priced of gas getting cheaper and cheaper. This has led to more money in my pocket and in the pocket of others. I realize that most economists and well-informed citizens agree that the president does not have a lot to do with the price of gas. However, any time the price goes up, he unjustifiably gets blamed. This was illustrated again in the most recent election. Therefore, since the price has gone down, I think he should get the deserved credit. It only makes sense to me. 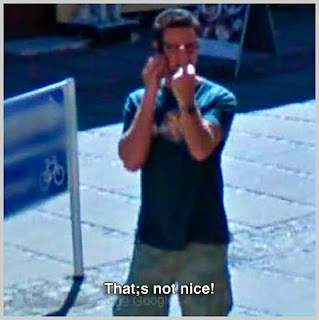 Well, my reader Chris in New Zealand reveals yet another hair clipper. 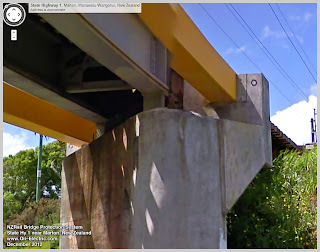 While he reported the New Zealand Rail 4.6-meter flyover, he neglected to report the 2.72-meter flyover! 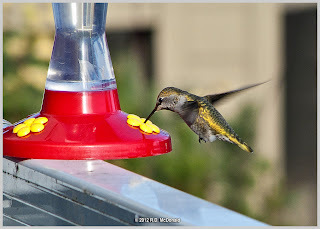 At 2.72m (8'11") this is the lowest rail fly over we have documented. 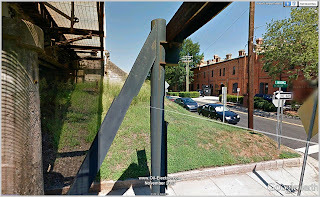 In fact, it is so low that the Google Camera Car was unable to navigate this structure. 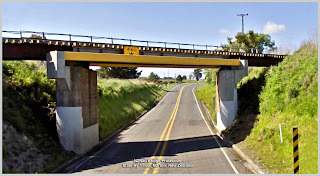 This Rail New Zealand bridge is located near Tokomaru on New Zealand's North Island. Google Street View became available as a tool in Google Earth in March 2007. I missed the launch. The computer I was running at that time was woefully incapable - speed, memory - to run the program. Now in its fourth generation of imaging technology. 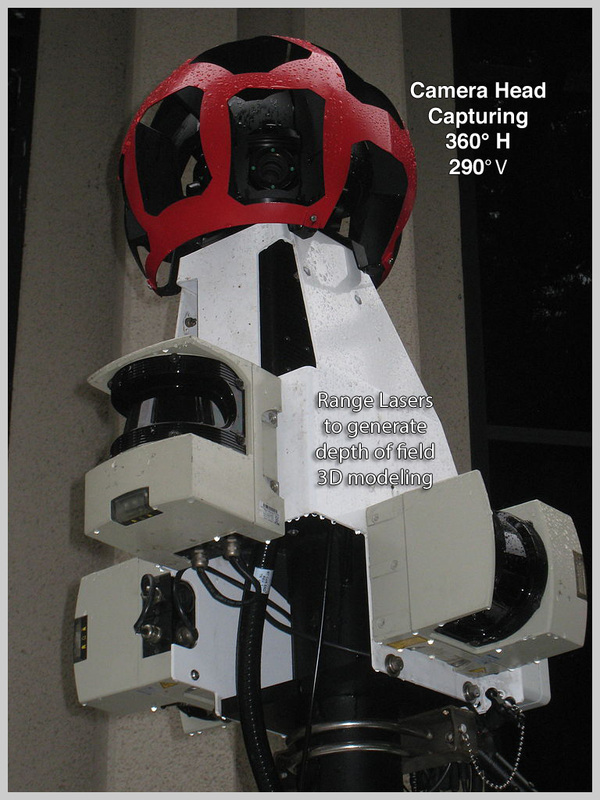 This article from the Institute of Electrical and Electronics Engineers (IEEE) Computer Society, details the history of the system and how the panoramic imaging system works. Each car - many are Subaru Imprezas - uses 15 cameras that snap 360 degree horizontal and 290 degree vertical images at a height of 8.2 feet (2.5 meters) feeding digital video and laser ranging information into a massive on-board computer array. Besides automobiles, snowmobiles and trikes are also fitted out with the panoramic image gathering equipment. This video of the Google Camera Trike, demonstrates its use on narrow streets and lanes. A great way to see beautiful the landscapes and burn off calories! 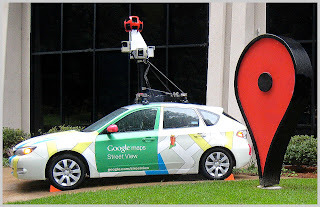 Germany, Switzerland, India and Austria have all sought bans preventing Google Street View camera recordings. Indeed, there may be understandable angst by some over such detailed access afforded by "Street View." 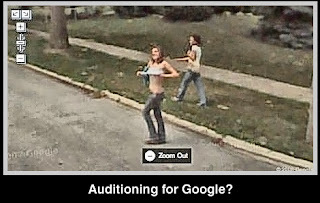 Google is not insensitive about privacy concerns. This article, also from the IEEE Computer Society, details extraordinary software developed which is successful about 89% of the time to blur faces and up to 96% to blur license plate numbers! Privacy issues aside, Street View has captured a number of "revealing" scenes. I remember looking up the address of a friend, and was dumbfounded to see the south end of woman in shorts, bending over her gardening! I never mentioned it out of embarrassment. 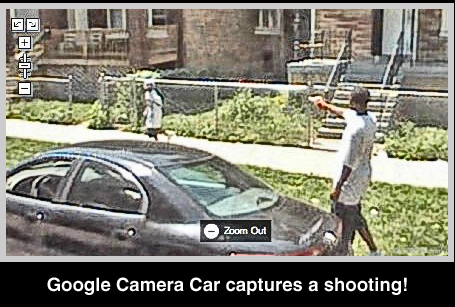 Despite Germany being upset with the Camera Car, areas of Germany are being "Street Viewed." In fact, employees from Fiat Motors "worked" the system to prank Volkswagen. It is not clear as to how they found out when the Camera Car would pass Volkswagen head quarters! 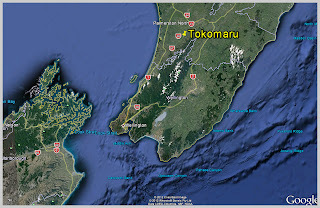 Flip side of the humorous; the devastating Japanese Earthquake. This site requires special attention. 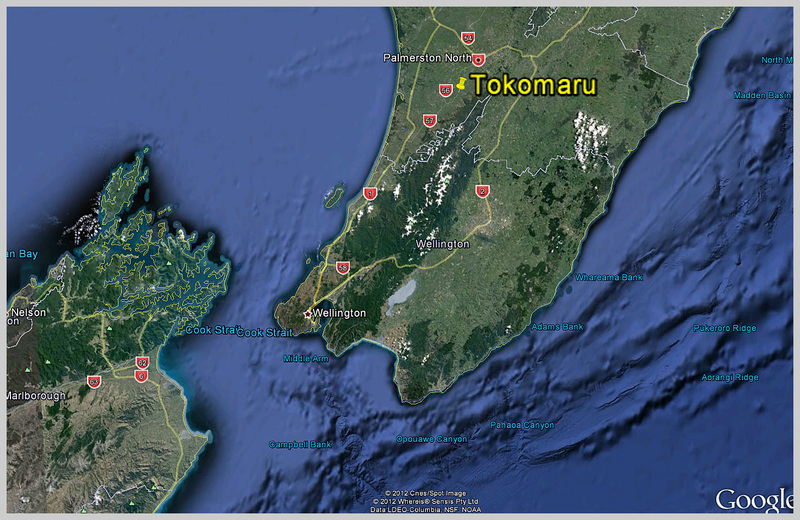 Here you are first confronted with an overall view of Japan. Using the "+" icon, continue to zoom in on an area of interest. Once you are in the area of interest, drag the "Oscar Icon" to that area, to begin your exploration, comparing "before" and "after." 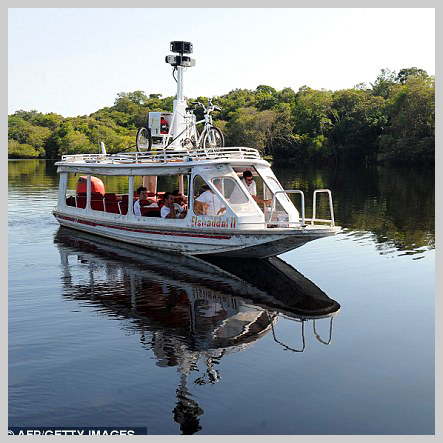 In August 2011, Google strapped a Camera Trike atop a tourist boat, and began making "Street Views" on the Amazon River. 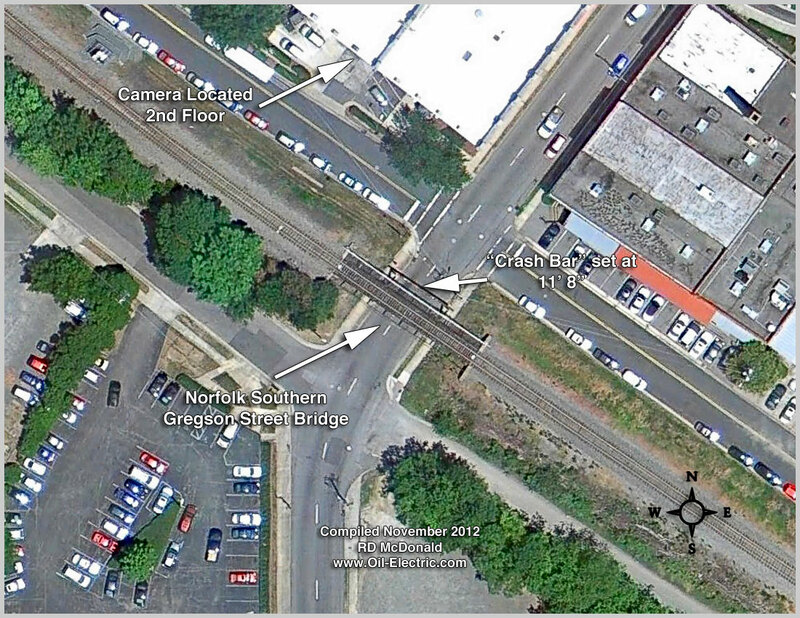 [Ed Note: When you bring up this link, click on "View in Google Maps" to begin your voyage of discovery.] I was surprised to see how much my town - Port Townsend - is covered, mostly main routes through and around town. I was surprised to see how much my town - Port Townsend - is covered, mostly main routes through and around town. 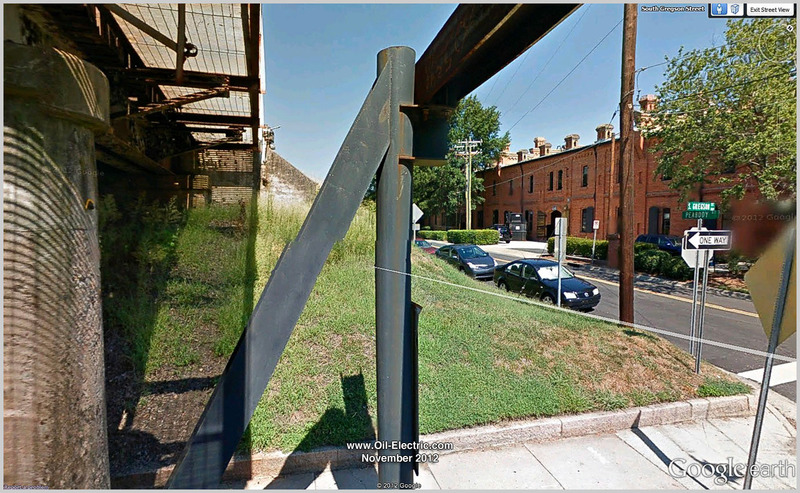 The Street View "timeline"details the incredible amount of photographing the world in a few short years. 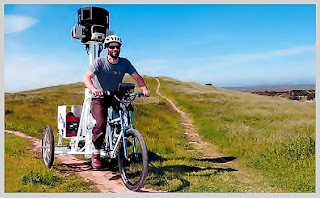 On October 30, 2012, Google announced that you can contribute to Street View by creating a panorama-like image from the Galaxy Nexus smartphone to share on Google Maps all around the world. To many people, Google means the best Internet search engine. But Google is much more. Google owns the Android operating system. And it was announced last month, that Google and Apple have formed a consortium to purchase more than 1,000 imagining patents from floundering Kodak. 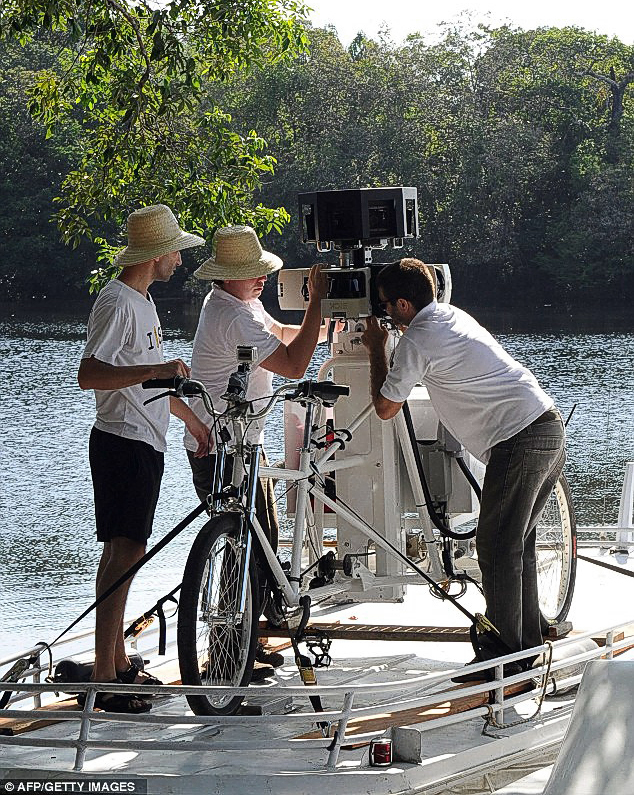 Google announced it had logged more than 140,000 miles on the Google Robo Car. The mileage was racked up in and around San Francisco, with an engineer behind the wheel if things went south. 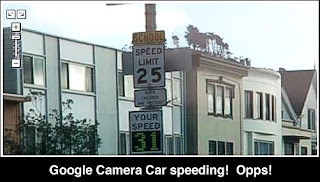 Google says it has no intention of manufacturing vehicles, but produce the "guidance systems" for vehicle installation. 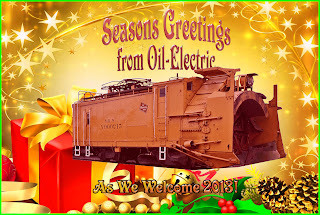 Nevada and California have already given the green light to establish operating policies and procedures, and expect the vehicles to begin operating in 2015. 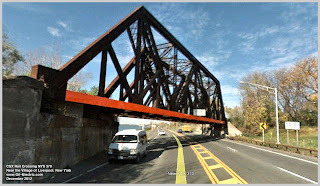 A very long time reader - back to the days when I posted on a high-brow picture posting site - referred me to another example of extraordinary measures taken to protect a railroad bridge. This is on State Highway 1, in the vicinity of Marton, New Zealand. 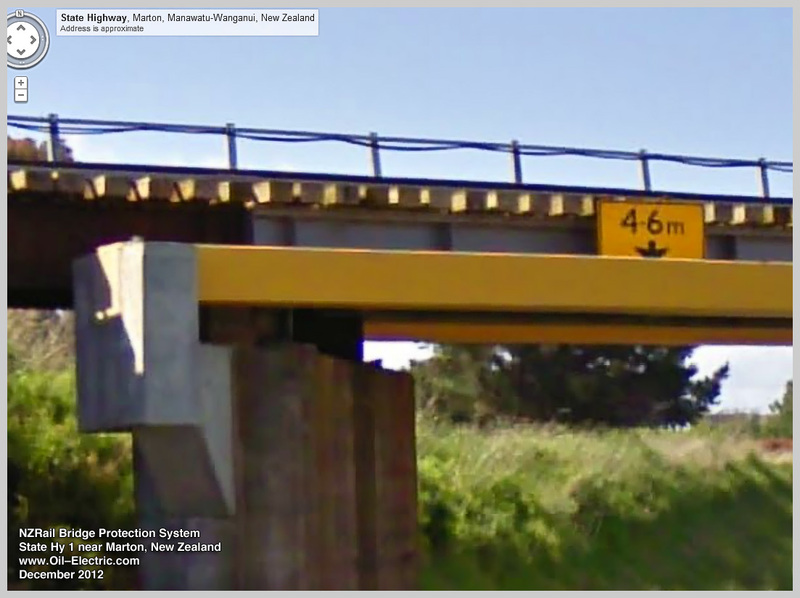 Chris writes me "I used to drive for NZRailways [engineer] and there was one overpass that gave me the creeps on account of the number of "stoopid" truckies down here. the propensity for the truckers to be "tired" around this part of the country. Always worried me that I'd not see the damage until it was to late. Considering the high number of hits and wedges it never happened though but I still worried none the less. 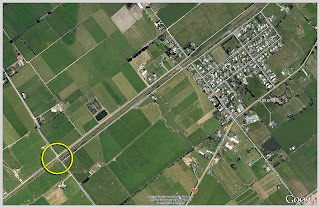 The track approaches to the SH-1 overpass are in open country, and on a downgrade towards the rail junction town of Marton which, with a roll on makes for extra difficulty in getting the train braked for a RED at Marton if you don't get into it early enough. 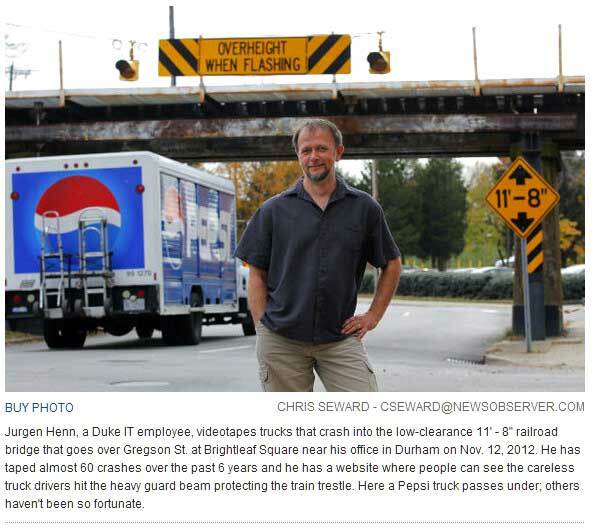 The train is on this overpass before you know it." I grew curious as to other dangerous clearance railway bridges, and was gobsmacked to find this hair clipper near the Village of Liverpool, just a few miles northwest of Syracuse, New York. 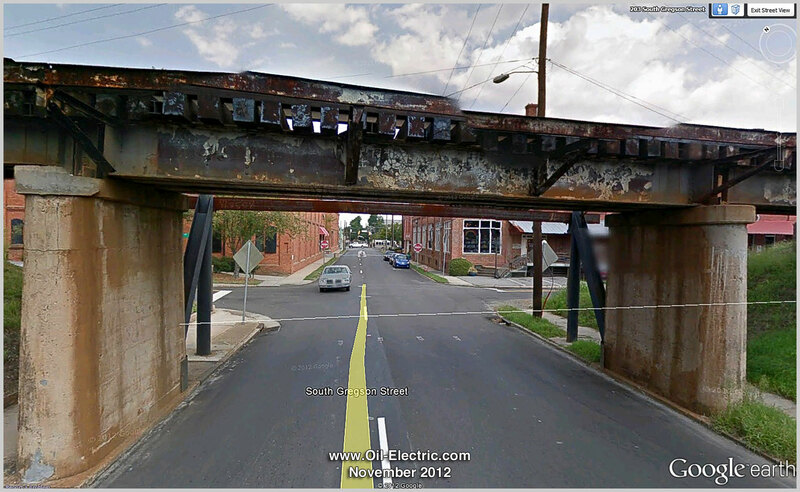 This CSX bridge has an astounding road way clearance of ten feet nine inches (3.27 meters). My van is 6'8", and the Bluebird school bus in this photo is ten foot six, just clearing the bridge by whiskers! Many vehicles have slammed into this structure. 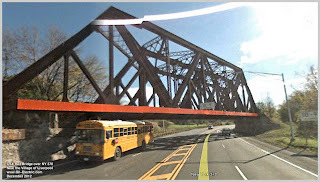 But it took four lives, when a bus crashed into the structure, to force the State of New York to enact rulings pertaining to the passage of motor vehicles on State Route 370, banning commercial vehicles. 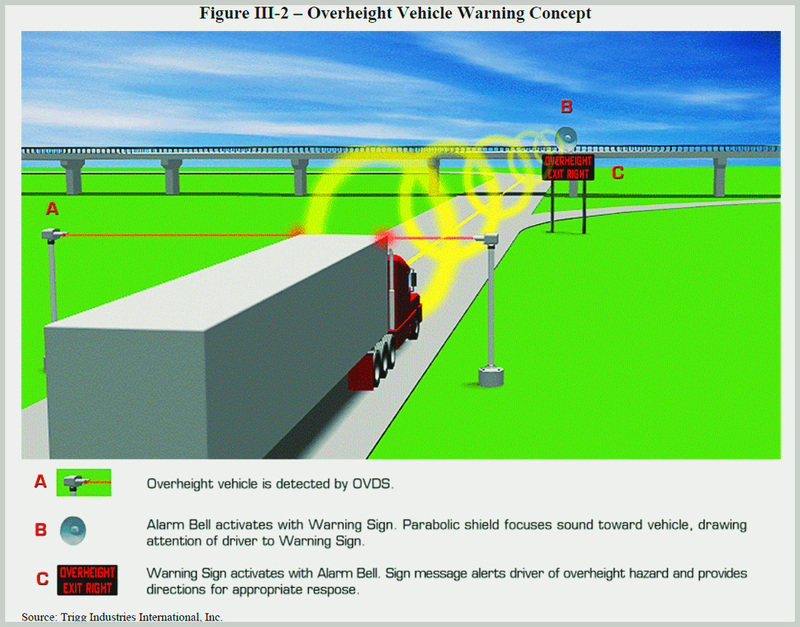 And installing an infra red detection warning system, similar to the one in Durham, North Carolina. Detection systems consist of infrared beams set at the safe clearance. 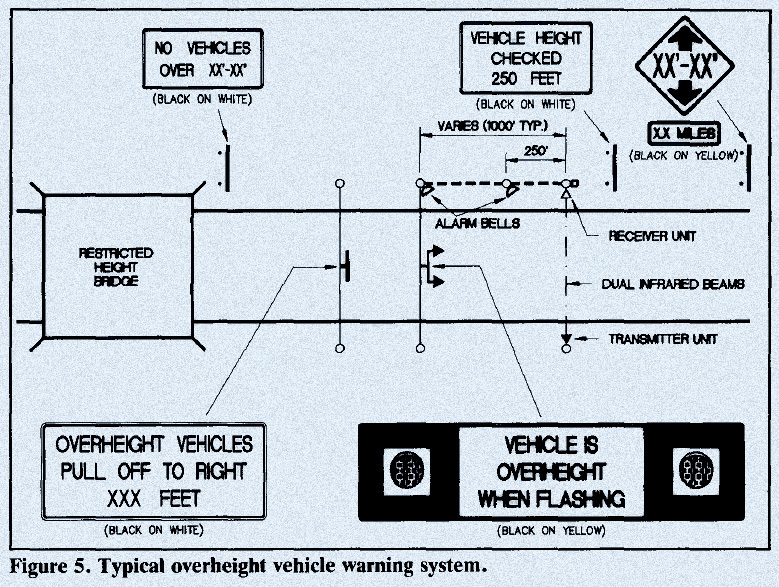 If a vehicle breaks the beam - too high - warning lights are activated. 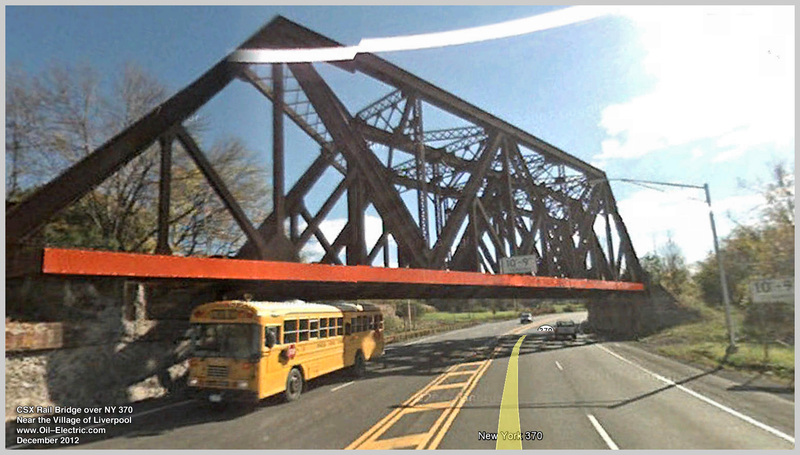 In the case of the Route 370, a radio signal is sent to the State Police, dispatching an officer to assist in getting the oversize vehicle turned around. 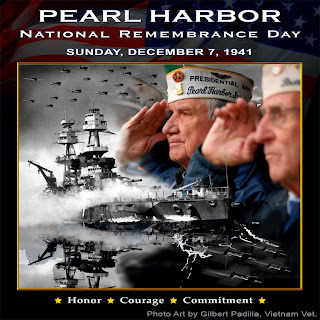 And issue a ticket!. 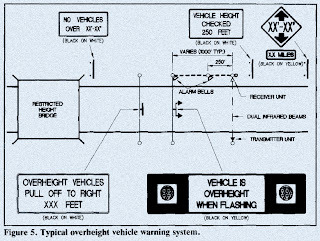 The test is - do they know the height of the vehicle they are driving, and are they paying attention to the warning systems that confront them. Do you know of a rail bridge lower than this 10'9"? I'd like to know about it. See Also: "11 Foot 8"
Our headline photo sets the stage for todays topic. 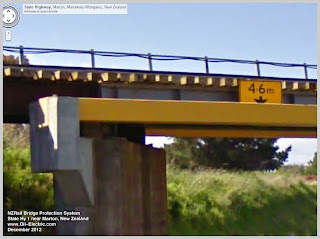 Looking carefully near the center of the photo, you see some sort of machinery impacted almost dead center with a cryptic yellow highway sign with the inscription: "5.1 m" - 5.1 meters or 16 feet 9 inches. 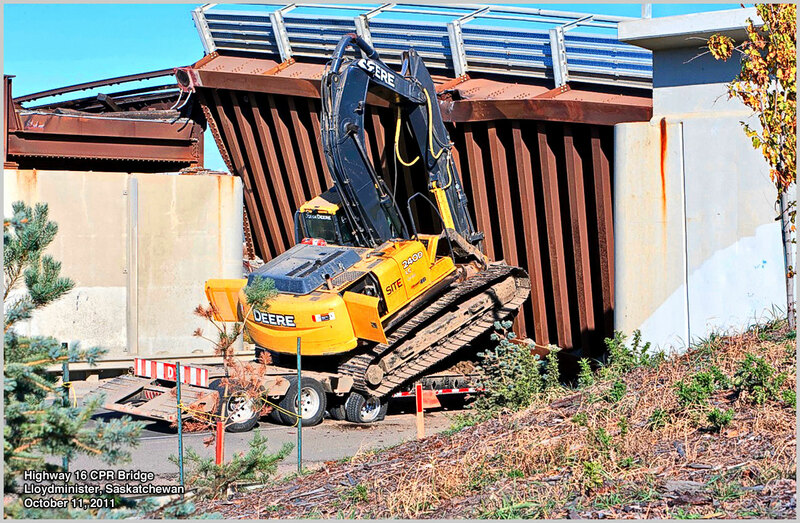 Here is another view of that machinery, a John Deere 240D excavator. 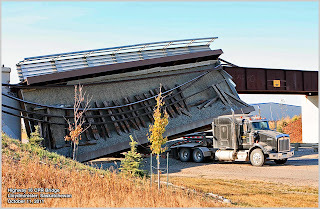 The innocent bridge knocked almost completely off its pier, was a Canadian Pacific Railroad crossing over Trans Canada Highway 16, near Lloydminister, Saskatchewan. 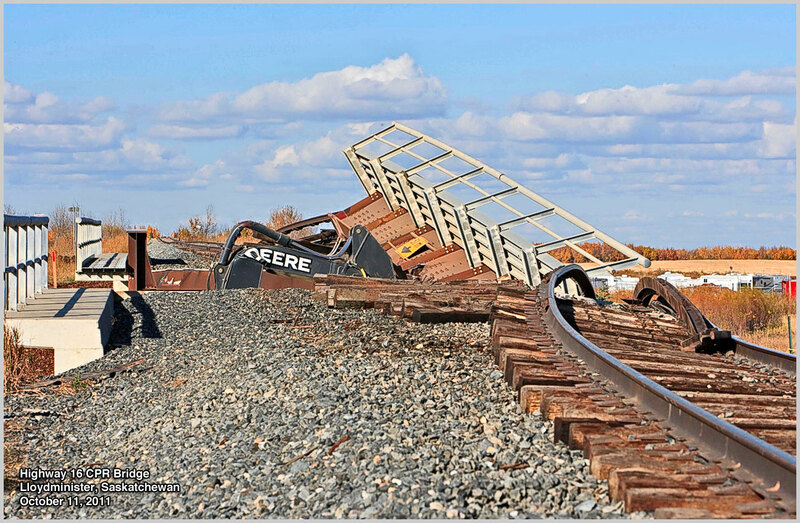 Fortunately, this track serves industrial areas. 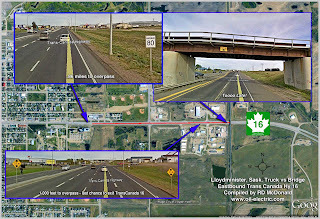 The 47 year old driver plead not guilty to the charge of "exceeding the maximum dimensions specified in a permit under the Highway Transportation Act." Speed limit on this stretch of Highway 16 is 80km, or 49.7 mph. He was NOT wearing seat belt, and complained of sore and swollen wrists! I would suggest that going instantly from 50 mph to zero, unconstrained, he was lucky sore wrists is all he suffered! The bridge was stabilized by cranes the following day. 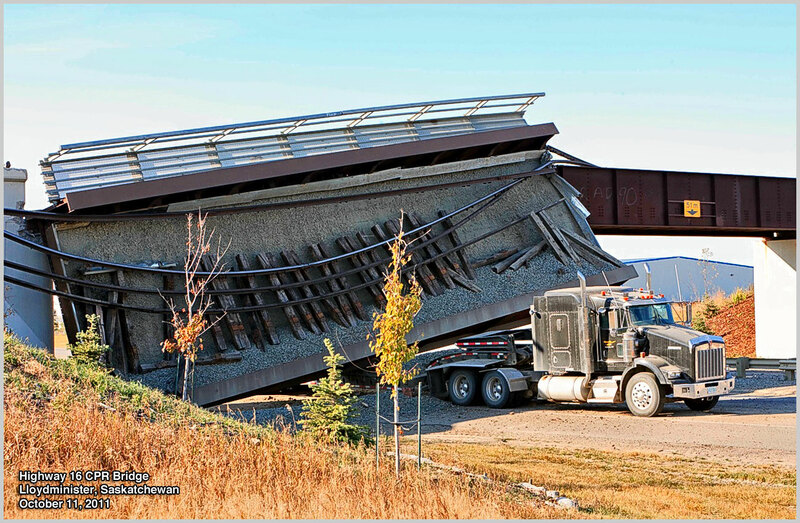 The afternoon of October 12th, two heavy cranes were used to lift the span, which was taken to Edmonton where it was declared salvageable. 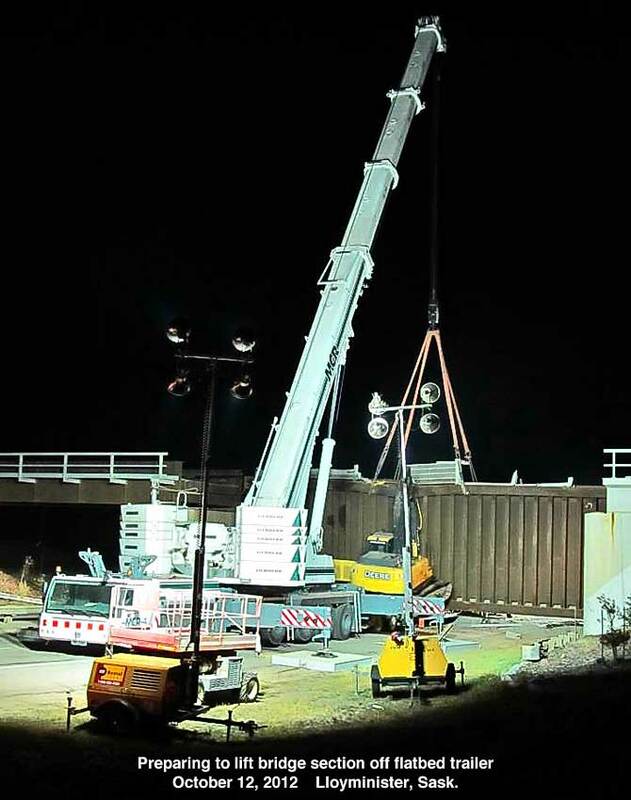 Following repairs, it was placed back in service at its original location! See further reading below. Comparing and contrasting a bridge knocked off its piers to a bridge under constant assault, for which an unusual solution has been applied to protect it. 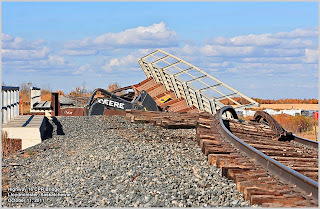 One of my Blog readers recently sent me a link to a YouTube video of trucks and recreational vehicles routinely decapitated by a railroad bridge. 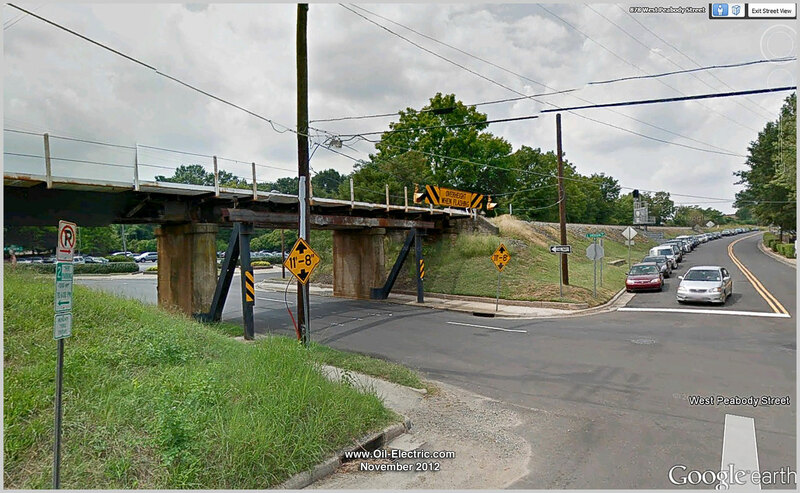 The Norfolk Southern bridge, is around 100 years old! And like it, there are hundreds of "legacy" rail bridges over highways, streets and roads, built during an era of smaller motor vehicles. 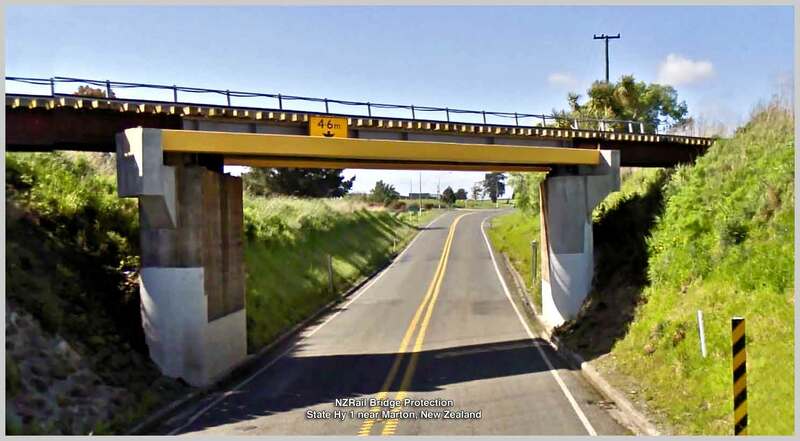 Todays Federal standard for bridges over highways, calls for clearances ranging between 16' (4.9 meters) to 14', depending on the type of road being crossed. 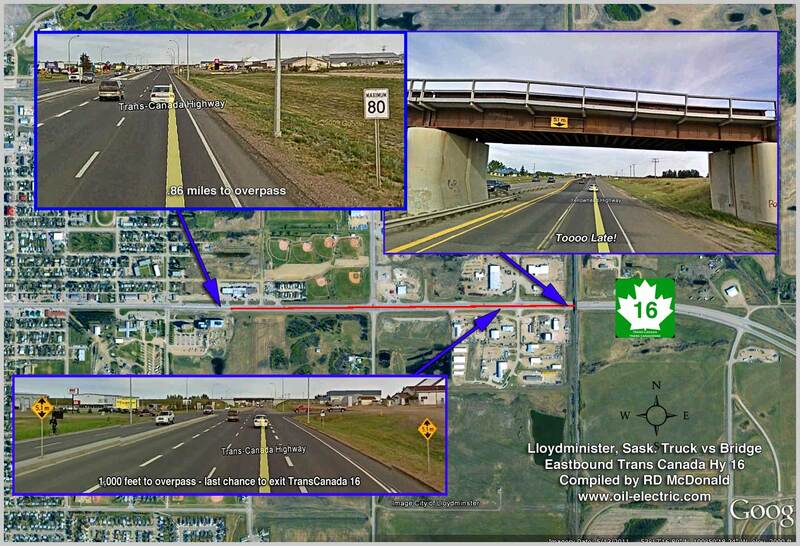 And 17' for pedestrian overpasses and signboards. See Federal Highway Administration ruling on bridge clearances. 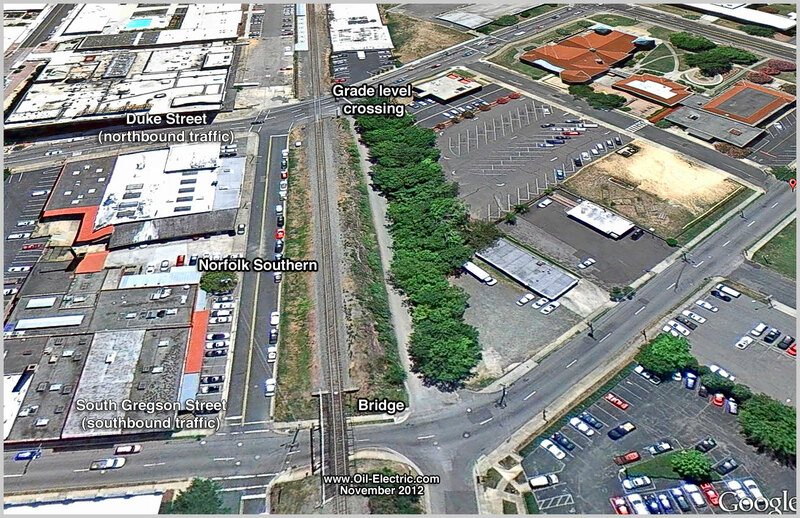 In Durham North Carolina, a one way street, South Gregson, feeds traffic into a business park, passing under the Norfolk Southern tracks. Northbound traffic feeding away from the business park, do so over a grade level crossing. The Norfolk Southern railroad bridge spanning South Gregson Street in Durham, North Carolina, is what I call "a legacy" overpass. 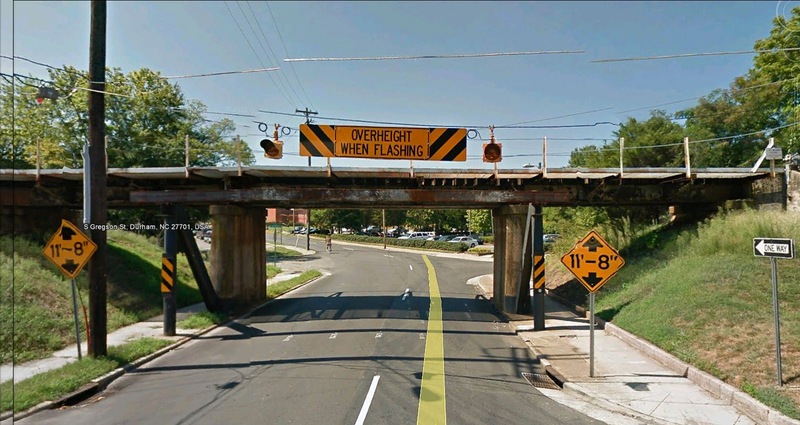 Vehicles exceeding 11'8" (3.55 meters) will be "decapitated." And it has been struck countless times by drivers who are either inattentive or ignorant of their vehicles height. 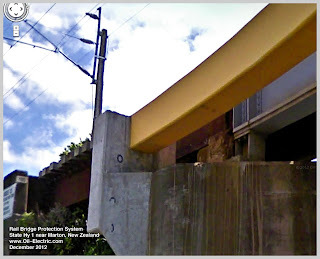 In fact it happens so often, that a fellow by the name of Jürgen Henn, set up a video camera in his second floor office vantage point overlooking the South Gregson Street underpass. 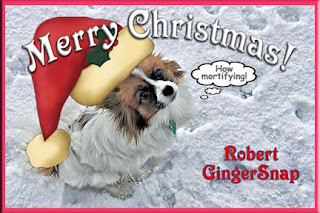 His videos have racked up thousands of viewers. Indeed, as you watch the video, notice the pickup towing a large travel trailer. Only the GPS tower and roof mounted air conditioner are clipped off ... at precisely 11'8"! 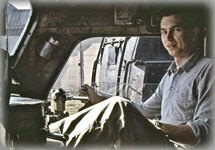 Mr. Henn has established a website, featuring memorable moments and very close calls. He's even marketing a tee shirt to monument man vs bridge! 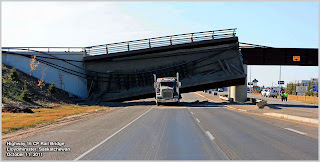 The initial collision can result in collateral rear end collisions as a result of the "immediate" stop, resulting in debris on the highway, resulting in additional traffic tie-up. 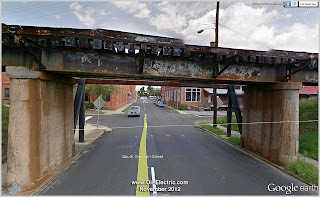 Norfolk Southern Railroad owns the rail trestle. 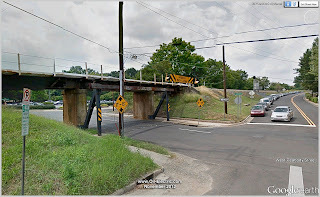 Since their number one concern is the safe passage of trains, they installed a steel I-beam "crash structure at precisely 11'8" just in front of the bridge. allowing the vehicle driver ample time to turn left or right before impending doom! Eleven foot eight isn't very high. My GMC Vandura is six foot eight. Mr. Henn has included a shot of a beam with a severe indentation! And apparently, all drivers seem to obey the "one-way" signs. 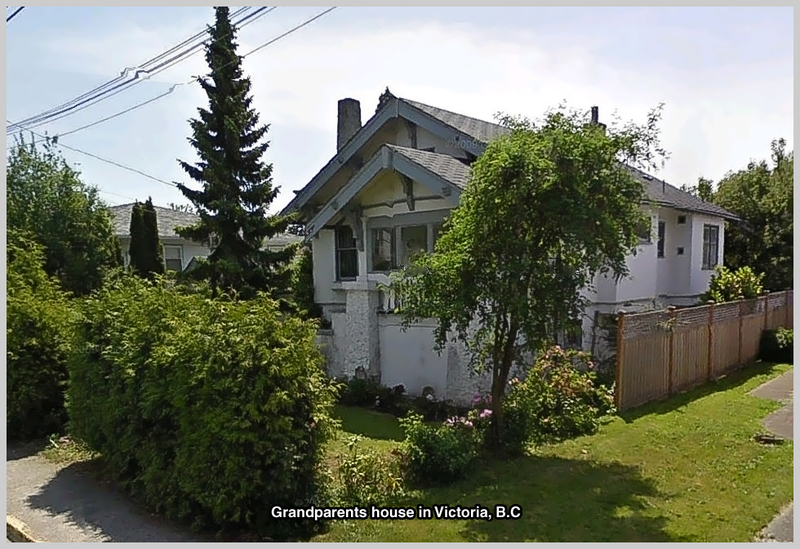 Since South Gregson is a one way street, no similar protection required on the "downstream" side of the structure ... so far! Despite the warning signs, lights and barrier, "the hits just keep on coming…"
See Also: "Bridge Protection with Pizazz ..."